This stunning 2018 1 oz Gold Lunar Year of The Dog Coin is a new release in the internationally known Lunar Series II. The series is based on the Chinese Lunar Calendar which is a 12-year cycle and each year is dedicated to a particular animal. 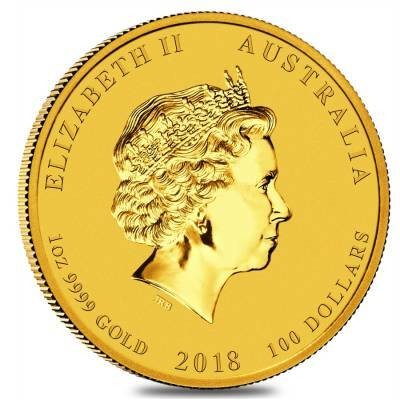 The Royal Australian Mint produces these gold coins in different sizes of 1/20 oz, 1/10, oz, ¼ oz, ½ oz, and 1 oz, which make them affordable for any level of precious metals investors. The coin reverse design is highly detailed and changes annually; 2018 Perth Mint design features a Labrador Retriever on rocks and featuring a stylised pine tree in the background. The obverse, on the other hand, will always be the same and is graced by a portrait of Her Majesty Queen Elizabeth II, created by Ian Rank-Broadley. These amazing coins are available in a variety of sizes: 1/20 oz, 1/10 oz; ¼ oz; ½ oz; 2 and 1 oz coins produced with a limited mintage. Struck from .9999 pure gold these coins are issued as legal tender under the Australian Currency Act 196. Individual coins come shipped in an acrylic capsule and will be a great addition to any precious metals collection. Made from .9999 fine gold with a weight 1 troy oz. Individual coins come shipped in an acrylic capsule. Limited mintage - no more than 30,000 coins. Coin face value - $100 AUD. Bullion Exchanges offers you a great selection of exclusive items from renowned international refineries. 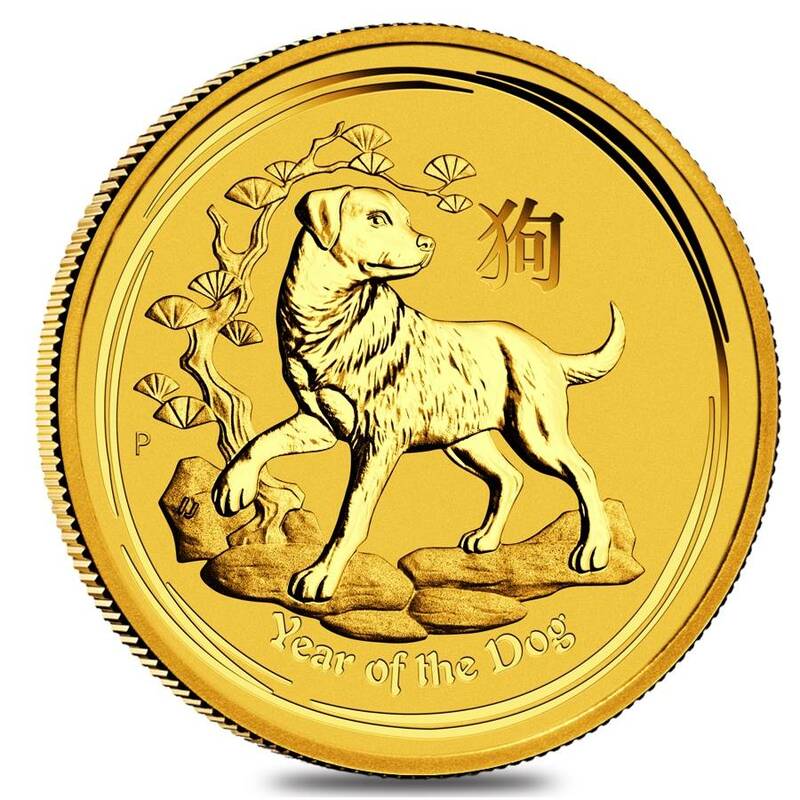 Add this stunning 2018 1 oz Gold Lunar Year of The Dog Coin to your collection today, and it will be carefully wrapped, packaged, and delivered to your address. If you have any questions, just call us at 800.852.6884, or send us a message, our customer service representatives will be happy to assist you. My wife will love this New Year gift. Lunar series is my annual must have! Love this new design! Look forward to placing my order. Thanks for offering this product at such a great price. I love collecting the Perth Mint lunar 1 oz gold series. they always appreciate in price in the future. Can't wait to get this one added to my collection. Year of the Dog is also one of my favorite in the lunar calender. For every $1 spend, you will earn 1 Bullionaire Buck which is equivalent to $0.001 off a future purchase. 1449 BB = $1.45.